10 Panel Drug Screen Test - CLIA-Waived! The MD 10 Panel Drug Screen Test is a fully integrated, self-contained drug test kit for detecting drugs and drug’s metabolites in urine. 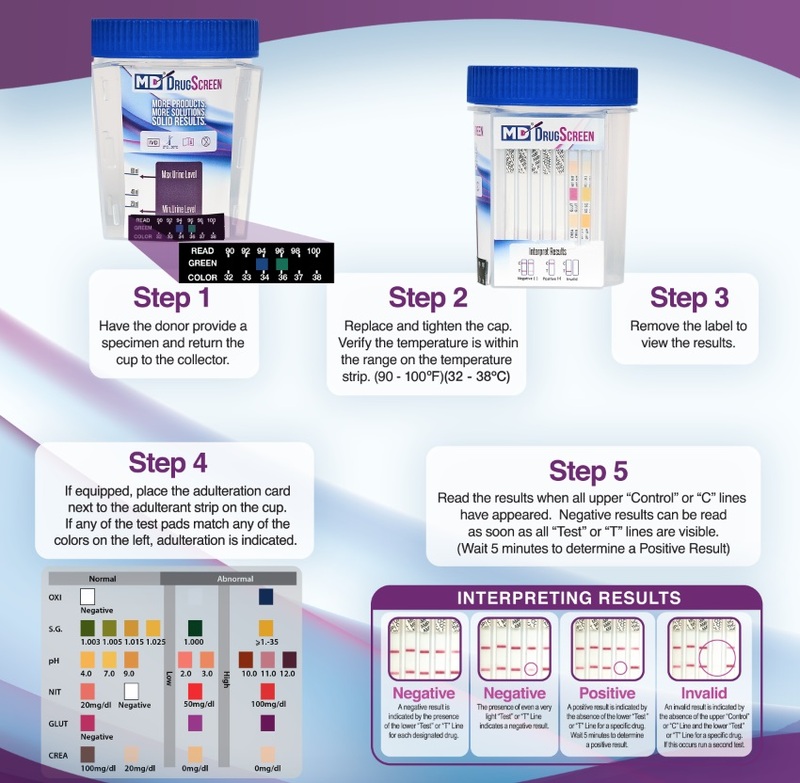 This One-Step 10 panel urine drug test cup eliminates the handling of any urine, eliminates urine donor tampering, provides a unique approach for on-site drug testing and is an accurate alternative to laboratory testing. With results in five minutes or less, time is saved by avoiding the typical 24 – 48 hour wait for results, as required by most laboratories. The 10 panel drug screen test is CLIA Waived and one of the most accurate tests available and cost effective. We offer highly competitive pricing – ideal for any budget; with our bulk purchase pricing structure, the One-Step Ten Panel Drug Test Cup is one of the most cost effective products on the drug testing market today. In addition, this test has a full 16 – 24 month shelf life providing you with greater opportunity to buy more and save. Detects the following drugs – Cocaine, Marijuana, Opiates, Amphetamines, Methamphetamine, PCP, Barbiturates, Benzodiazepines, Methadone, and Tricyclis Anti Depresants. Detects the following drugs – Cocaine, Marijuana, Opiates, Amphetamines, Methamphetamine, PCP, Benzodiazepines, Barbituate, Methadone, Oxycodone. Detects the following drugs – Cocaine, Marijuana, Opiates, Methamphetamines, Tryciclics Anti-Depresant, Barbiturates, Benzodiazepines, Methadone, Oxycodone, and Buprenorphines. BULK PRICING - The more you buy the more you save! Call 419-852-2464 to get your quote!